RG Herald: GEAR UP Goes F.I.R.S.T. 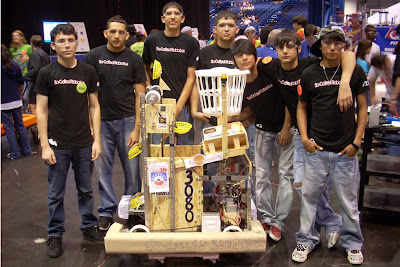 On March 26, 2009 in Houston , Texas , 67 teams and their robots joined together at the George Brown Convention Center to compete against each other for 1st place at the Lonestar Regional Event for the F.I.R.S.T. (For Inspiration and Recognition of Science and Technology) organization. Out of the 67 teams only 23 were rookie teams. We were one of those 23 teams. The object of the game, named “Lunacy” for the anti-gravity effect on the robots, was to score points by placing as many “moon rocks” in the opposing teams’ trailers. In each match, there were two alliances with three teams on each alliance. These alliances were put together randomly to help make the competition more fair. Each team competed in seven qualifying matches that led up to the finals. We were ranked 11th as we headed into our final qualifying match. All we had to do was win this match to finish in the top 8 and advance to the finals. Unfortunately, we were not able to win that match. We finished 17th place out of 67 teams that day. We did fairly well considering that only 3 rookie teams finished in the top 20. Overall, this competition was a great experience. We had a great time competing, strategizing, meeting new people, etc. This first year competing helped us learn a lot more about the competition and how other teams work together to get the advantage over other teams. Our team definitely looks forward to next year and the years to come in F.I.R.S.T. The So-Called Robotics team (Alvaro, Billy, David, Eden, Eloy, Ernie, and Jose) would like to thank the Bezos Family Foundation; Miss Tina Atkins and Region One ESC GEAR UP; Mr. Jorge Recio, Mr. Arturo Menchaca, and the Rio Grande City High School CATE Department; Mr. Juan Andrade, Ms. Melissa Andrade, Mr. Ricardo L. Lopez, Jr., and Mr. Heriberto Reynoso for their support and guidance throughout the robotics competition season.